At the invitation of the government of the Czech Republic and the government of the Republic of Croatia, Vice Premier of the State Council Sun Chunlan will pay official visits to Czech and Croatia from November 18 to 25. At the invitation of the Boao Forum for Asia, State Councilor Wang Yong will attend and deliver a keynote speech at the opening ceremony of the Boao Forum for Asia Seoul Conference in the ROK from November 19 to 20. Q: Recently Australian Prime Minister Morrison reportedly said that Australia would like to leverage its newly-announced fund of 2 billion Australian dollars to work with China for infrastructure projects in the Asia Pacific. Australia does not see the necessity to choose between the US and China and instead should seek to improve ties with the two countries. The more stable the region is, the more prosperous it will become. Prime Minister Morrison also said that Australia would consider taking part in the Belt and Road Initiative in light of the specific conditions of the projects. What is your response? A: We have noted and welcome these positive remarks by Prime Minister Morrison. As members of the Asia-Pacific family, China and Australia all hope well for the development of the Pacific Island countries. We have many ways to complement each other's strength in helping these Island countries strengthen infrastructure, improve people's livelihood and achieve sustainable goals, and contribute to regional development and prosperity. We would like to enter into third-party cooperation with Australia in light of the needs and aspirations of the Island countries. China, the US and Australia are all important countries in the Asia Pacific and share an extensive range of common interests in maintaining world peace and development. Thus, cooperation stands as the right choice for all. As for the Belt and Road Initiative, we have stressed many times that it is a transparent, open and inclusive initiative following the principle of extensive consultation, joint contribution and shared benefits. China welcomes the participation of more countries including Australia in the Belt and Road cooperation and believes that more practical cooperation between China and Australia on the Belt and Road Initiative will definitely deliver more opportunities to the two countries and the region. Q: Reports say that many US lawmakers will today introduce a legislation urging the Trump administration to make a response to alleged human rights "abuses" in Xinjiang. Has the Chinese side already complained to the US side about this proposed legislation? A: When raising this question, how do you think of these moves by the US lawmakers? It is really a wonder to me that these lawmakers think they are so superior that they can point fingers at other countries' domestic affairs. How much do they know about the real situation in other countries? And how much do they know about the situation inside their own? They are spending their taxpayers' money, but instead of focusing on serving their people, they always choose to ignore myriad problems facing their own country and are too obsessed with poking their noses in the domestic affairs of others. They have been extending their long arms to meddle in other countries' domestic affairs based on misinformation and strong ideological bias. I said before that according to the Human Rights Record of the United States in 2017 published by the State Council Information Office, systematic racial discrimination in the US aggravates its social split. A study from the U.S. National Registry of Exonerations released on March 7, 2017 showed that African Americans were about seven times more likely to be wrongfully convicted of murder than white Americans. When it comes to drug crimes, black Americans are about 12 times more likely to be wrongfully convicted than innocent white people. Black male offenders received sentences on average nearly 20 percent longer than those of similarly situated white male offenders. Besides, minority groups in the US are overall disadvantaged in employment and payment. More than one in four black households have zero or negative net worth. 42 percent of Americans say that they personally worry a great deal about race relations in the US, and 58 percent of Americans say that racism is a big problem in their society. We hope that these lawmakers you mentioned could care more about their own affairs and put their own house in order. If with their efforts, the minorities living in the US could live an equal, fulfilled, happy and safe life like the 56 ethnic groups in China do, then I believe it would be truly a good deed. Last but not least, I want to remind you, if you are covering this story, I hope you could write what I just said about the US problems in a complete and detailed way so that these lawmakers could see, hear and know how they are viewed outside their country. Q: According to reports, on November 13, the Director General of the IAEA has confirmed again in his latest report that Iran has been abiding by the terms of the JCPOA. What is your comment? A: China has noted the latest report submitted by the Director General of the IAEA. This is for the 13th time in a row that the IAEA Director General has confirmed Iran's compliance with its nuclear-related obligations under the JCPOA since it took effect in 2016. The report mentioned that the IAEA has been supervising and verifying Iran's nuclear programs in accordance with its mandate in an objective and unbiased way. 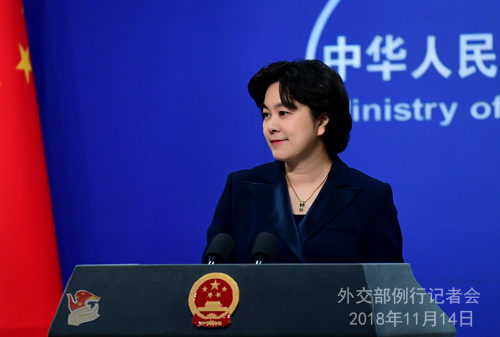 China welcomes that and commends the efforts made by the Iranian side and the IAEA. 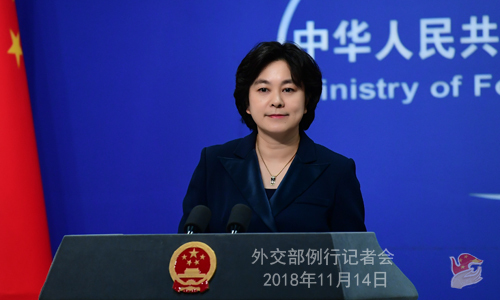 As has been stressed many times by the Chinese side, under the current circumstances, we hope that all relevant parties could bear in mind the whole and long-term picture, fulfill respective duties and obligations, and continue to uphold and implement the JCPOA, since this serves the common interests of the international community. Q: Sri Lanka continues to experience political upheaval. Earlier, the Sri Lankan President dissolved the parliament, subsequently, it was stayed on by the Supreme Court, and today, the Prime Minister appointed by President Rajapaksa has been defeated in the parliament, and no-confidence motion has been approved. Do you have any comment about the current situation in Sri Lanka? A: As a traditional friendly neighbor of Sri Lanka, China has been closely following the developments of the situation in Sri Lanka. We hope that Sri Lanka can maintain stability. We hope and believe that all relevant parties in Sri Lanka have the wits and ways needed to deal with the current situation. Q: I have two questions. First, US Vice President Mike Pence will attend APEC and has plans to hold a meeting with Taiwan's APEC representative. Is this acceptable within the bounds of the relevant MOU, or is this an instance of the US side sending a wrong signal to the Taiwan authorities? Second, after a coup in Fiji in 2006, many Western countries withdrew their involvement in Fiji, but China stepped up its engagement with Fiji. Is this an example of China taking advantage of a vacuum in international influence? How does China look at its relations with Fiji after the elections in the island? A: Your first question involves two aspects: Taiwan's participation in the APEC events and the exchanges between the US and Taiwan. Adhering to the one-China principle and observing the stipulations in the relevant MOU is the basis and prerequisite for Taiwan's participation in APEC. Any party should abide by the one-China principle instead of playing any tricks. Regarding the exchanges between the US and Taiwan, our position is also very firm. We urge the US side to abide by the one-China principle and refrain from having any form of official exchanges with Taiwan. You also mentioned China-Fiji relations. First of all, in response to your viewpoint, I want to make clear that China never believes that a certain country or region should become the sphere of influence of another country or several countries. We maintain that all countries, big or small, are all equal. All countries should refrain from interfering in other countries' domestic affairs and fully respect the development path chosen by other countries as well as their right to independently decide with which countries they will develop ties and conduct cooperation. 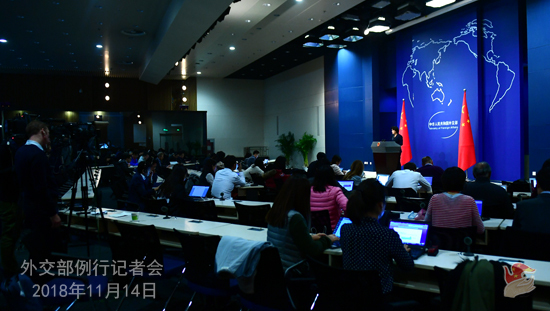 Yesterday, the Foreign Ministry gave a press briefing on President Xi Jinping's attendance at the 26th APEC Economic Leaders' Meeting, his state visits to Papua New Guinea, Brunei and the Philippines and his meetings with the leaders from the Pacific Island countries that have established diplomatic ties with China. Vice Foreign Minister Zheng Zeguang answered the questions in a detailed way raised by journalists on the Pacific Island countries. I only want to stress one point. China's ties with Fiji and other Pacific Island countries are South-South cooperation as well as the mutual support and assistance between developing countries. We hope that the general election in Fiji can be held smoothly. We hope to develop friendly and cooperative relations with Fiji and other Pacific Island countries under the principles of mutual respect, equality, mutual benefit and non-interference in each other's domestic affairs. We believe that President Xi Jinping's upcoming meetings with the leaders from the Pacific Island countries that have established diplomatic ties with China in Papua New Guinea will map out new blueprint and open up new prospects for the growth of China's ties with Fiji and other Pacific Island countries going forward. Q: A report by the US-China Economic and Security Review Commission to the US Congress today recommends that the US government should create a fund to counter Chinese infrastructure financing in the developing world. Have you seen this report and do you have any comment on that? A: I have not seen the report mentioned by you. China always conducts cooperation with other countries under the principles of mutual respect, equality and mutual benefit. If the US is willing to invest more to help other countries enhance infrastructure building and improve livelihood, we welcome that. We hope that the motives of the US are pure and that the US can make more substantial financial contributions and take more concrete steps to achieve good results. Q: I would like you to comment on two things. The first being the call for a joint European Union military force or European army to protect against Russia, the US and China from French President Macron and German Chancellor Merkel. The second being the recent discovery of 16 hidden ballistic missiles bases in the DPRK according to a report issued by a US think tank. A: Regarding your first question, I have noted that there have been many reports in the past few days. I have also noted the response made by the US side to the relevant speeches of the European leaders. I want to say that the EU members are sovereign states and they have the right to decide their diplomatic and defense policies. As to whether Europe views China as a military threat, I believe you are all fully aware that China never ever poses any threat to Europe. In fact, a few days ago, a commemoration was held to mark the centenary of the end of the First World War in Paris. The European leaders recognized that the Chinese laborers have made great sacrifices for the peace in Europe during that historical period. The leaders from many European countries expressed their willingness to support China's peaceful development and further step up cooperation with China on different occasions. Yesterday, during the China-German Diplomatic and Security Strategic Dialogue, German Foreign Minister Heiko Maas also said that Germany and China do not pose threat to each other and that Germany is willing to strengthen cooperation with China. As to your second question, you know that we cannot verify the report issued by a think tank. But I want to point out that over a period of time, thanks to the concerted efforts of all relevant parties, the situation on the Korean Peninsula has witnessed some positive changes. The US-DPRK summit is an important step in the direction of politically resolving the Korean Peninsula nuclear issue. We hope that the US and the DPRK can implement the outcomes of the summit, enhance mutual trust, continue with their efforts to address each other's concerns through dialogue and consultation and move forward the political settlement process of the Korean Peninsula issue. Q: We have noted that US Vice President Mike Pence, when holding a joint press conference with Japanese Prime Minister Shinzo Abe yesterday, said that the US hopes that all nations in the Indo-Pacific are free to follow their own path and pursue their own interests and that authoritarianism and aggression have no place in the Indo-Pacific. What is your comment? A: China always maintains that all countries should follow the principles of mutual respect for sovereignty and territorial integrity, mutual non-aggression and mutual non-interference in domestic affairs. All countries have the right to independently pursue the development path that suits their own national conditions. All of these are the important contents of the Five Principles of the Peaceful Coexistence. We have noted that Mr. Pence made the public statement that he hopes all countries in the Asia-Pacific region are free to follow their own path. This is very good. We hope that the US side can translate their words into actions and that not only in the Asia-Pacific region but also in all other places around the world, the US can respect and support the efforts made by all countries to pursue the path of their own choice with no inference, intimidation, threats, aggression or double standards.